Just enter the address of your site, then click Map Site. PowerMapper is an automatic sitemap creation tool for SEOs, web site owners and web developers. It is used in more than 50 countries, by 30% of the Fortune 100, and major organizations like NASA and MIT. PowerMapper draws maps in a range of useful and attractive styles using thumbnails of each page. You can also export a Google XML sitemap, or an Excel CSV. 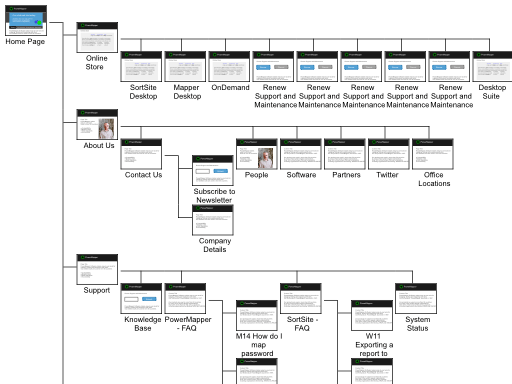 Creating a site map manually takes hours or days, even for medium size sites. PowerMapper creates site maps automatically with a single click. Generating this kind of map of an existing site should be the first step anyone takes when redesigning a site. Steve Krug, Author "Don't Make Me Think"